Shangri La Minsk managed by Storm International is one of the most famous and popular casinos in Belarus. It has been operating since 2009 and five times during this period it was recognized as the best in the capital and in the country. In 2018, Shangri La Minsk celebrated its 9th anniversary. The history of the Belarusian Shangri La, Darren Keane told, started thanks to Shangri La Moscow. In 2009, the Russian unit, which worked for more than 15 years, had to be closed due to changes in the legislation of the Russian Federation. But even such a not-so-good change led to a positive result. This opened Shangri La Minsk, one of the notable adornments of the Belarusian capital, became popular among the respectable public and foreign guests. Shangri La Minsk offers a variety of quality holidays: casino games, theme parties, lotteries of great prizes, musical nights, and gastronomic events. 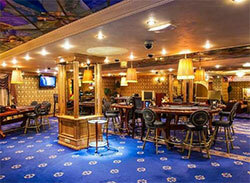 Regular guests of the casino know that there is a great restaurant here. For many years, it has been managed by the chef Mark Ulrich, specializing in European cuisine. Every weekend there are gastronomic evenings dedicated to the cuisines of different nations of the world: Russian, Mexican, German, Italian, Japanese and others. In July 2018, Shangri La Minsk was 9 years old, in honor of this event, there was a carnival party. The main guest of the night was the rock band Mashina Vremeni. And every guest got a chance to participate in the drawing of 50 000! Thanks to the thoughtful management of Storm International, Darren Keane said, Belarusian Shangri La was awarded the «Choice of the Year» award five times. To get the prize, administered by European and American organizers, is quite difficult. To do this, the casino must comply with a large list of requirements. Shangri La Minsk manages to keep the championship among casinos from 2013, which is a worthy subject for pride.